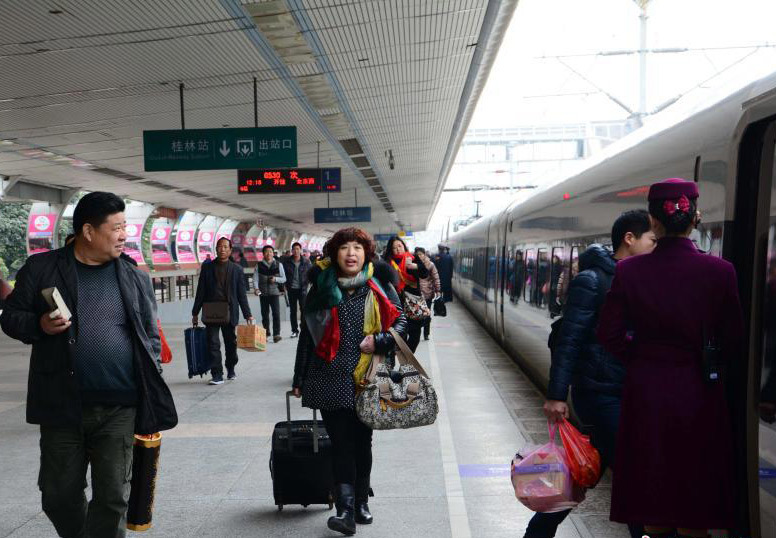 A high-speed rail line, connecting the Chinese capital of Beijing with Guilin, a popular tourist destination in southwest China, came into service on December 28, 2013. A new pair of bullet trains G529/30 is set to run along the 1958-km-long line every day; and the travel time between the two cities has been shortened from about 26 hours to 10.5 hours. The high-speed bullet train G529 from Beijing to Guilin will set out from Beijing West Raiway Station at 7:46, stop in Zhengzhou East Railway Station at 10:53, Wuhan Railway Station at 12:53, and arrive at Guilin Railway Station at 18:18. For the Guilin-Beijing West G530 train, it will dispatch from Guilin Railway Station at 12:15 and arrive at Beijing West Railway Station at 22:51. The ticket price between Beijing and Guilin is 2,530 yuan ($415) for a business-class seat, 1,250 yuan for a first-class seat and 806 yuan for a second-class seat. And across China, seven new high-speed rail links started operation on December 28. Thus, the national high-speed railway network consisting of eight major lines - "four horizontal and four vertical" - has taken shape. Guilin can be easy of access by bullet trains, from Beijing, Shanghai, Guangzhou and other cites on this network.